I’ve read hundreds of press reports in local newspapers about Elvis’s appearances in dozens of communities in the 1950s. Most of the articles fit into two basic categories: the interview and the day-after concert review. Early in his career, Elvis often gave interviews to individual journalists and disc jockeys prior to doing his show. As his popularity exploded, the growing demand for interviews forced him to adopt the single press conference format in each town. There was a pattern to most of the newspaper articles that resulted from these interviews. They usually included a description of Elvis—how good-looking he was, what he was wearing, etc. 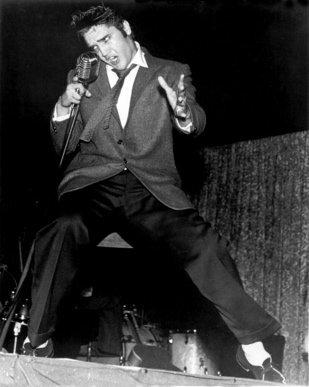 The writer then commented on Elvis’s demeanor, particularly how respectful he was—using “sir” and “ma’m” all the time. The bulk of the article, however, was usually a recounting of the questions asked and Elvis’s responses, both of which were repeated over and over from town to town. Once in great while, however, I’ve come across a really unique and well-written newspaper article by a reporter who had the opportunity to interview Elvis. A young reporter (an assumption from Elvis’s continually calling her “honey” instead of “ma’m") wrote one such article for the Waco News Tribune. Bea Ramirez interviewed Elvis just before he took the stage in Waco on April 17, 1956. For starters, the interview was unique in that it took place in Elvis’s Cadillac moments before he went on stage. What made Miss Ramirez’s article special, however, was her ability to capture the wonder and insecurity in Elvis, who only recently had found himself caught up in a whirlwind of adulation and controversy. 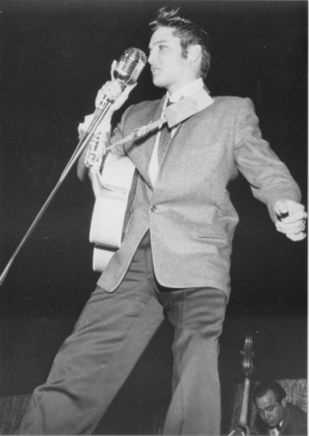 Shortly before he was to go on stage at the Heart O’ Texas Coliseum, Elvis Presley, the 21-year-old king of the nation’s rock ’n’ roll set, sat in a darkened Cadillac limousine for an interview—well hidden from the sight of nearly 4,000 screaming, squealing teen-agers who were on hand to welcome him Tuesday night. All the hep cats were there and not enough fuzz (cops). Out in the stands and on the floor, his audience of idolizing teen-agers did all but hiss and boo to rid the stage of a group of other hillbilly entertainers and bring Presley out behind the microphone that he handles more like a limp blonde than a mechanical gadget. Presley has a way with that “honey” business. When he talks, he looks straight ahead, or sort of dreamy like in no direction at all. Then he turns with that “know what I mean, honey?” His face is close, real close. Right in your face—almost. “Yeah, I know, but this time it will be different.” The way he says “different” it really will be. “No, honey, sure won’t. Going to be in it with Katharine Hepburn and Burt Lancaster, and I won’t sing. I don’t want to, I want to be an actor.” Then he turns and stares into the crowd again, listens to one of the other entertainers singing and grins slowly. And he drove out to meet the hysterical adoration of young girls and boys whose emotions he has found are easy to stir up with a song. "His audience of idolizing teen-agers did all but hiss and boo to rid the stage of a group of other hillbilly entertainers and bring Presley out behind the microphone that he handles more like a limp blonde than a mechanical gadget."